Momordica charantia is an annual and has a creeping or climbing stem. 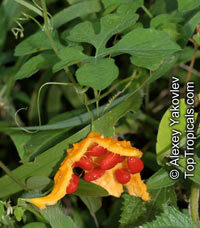 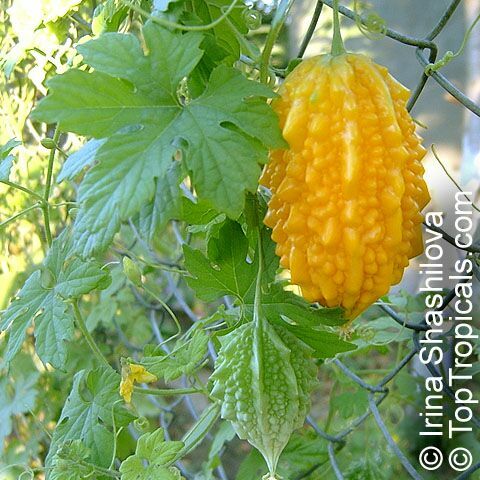 The fruit is broadly egg shaped, beaked, bumpy, ribbed, to 10 cm long and golden yellow to bright orange. 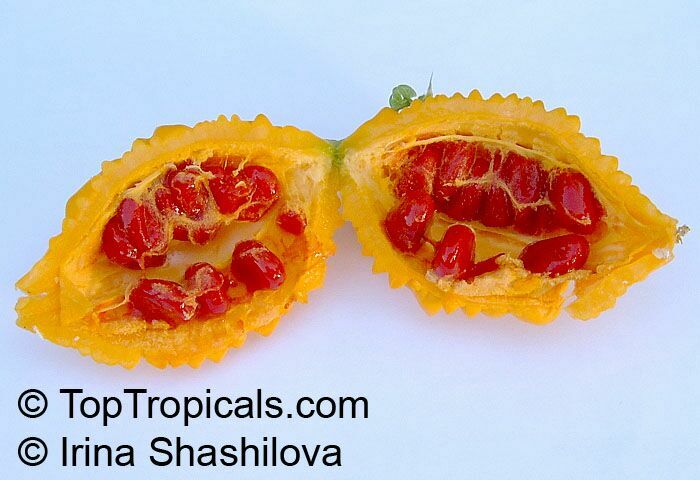 At maturity the fruit breaks, bursting open along the 3 valves. 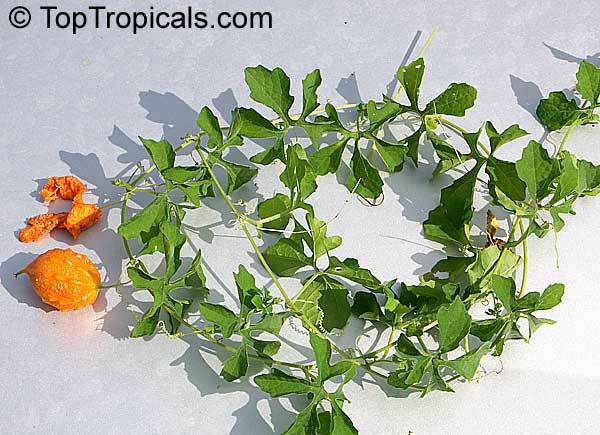 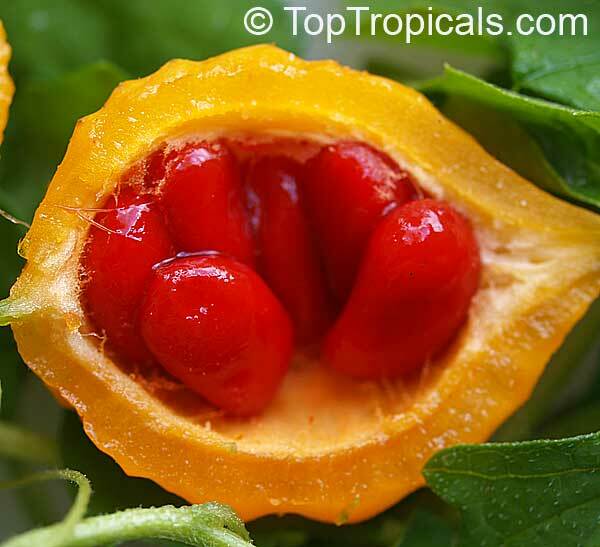 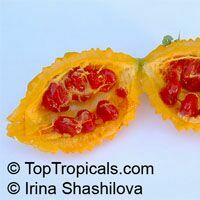 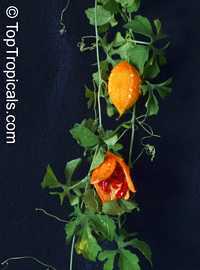 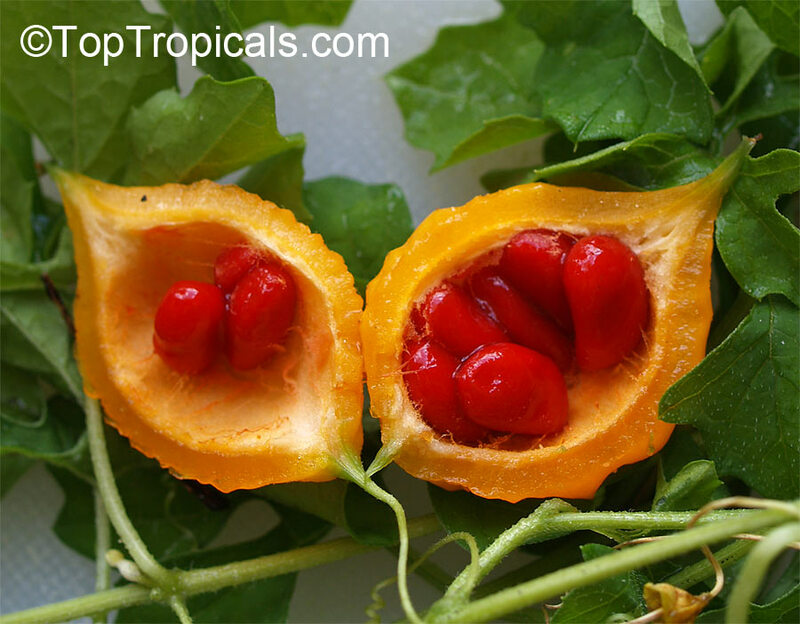 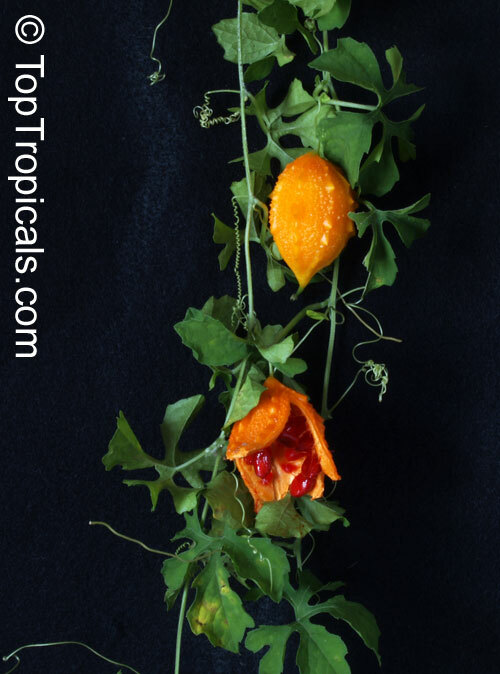 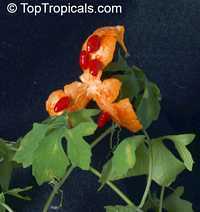 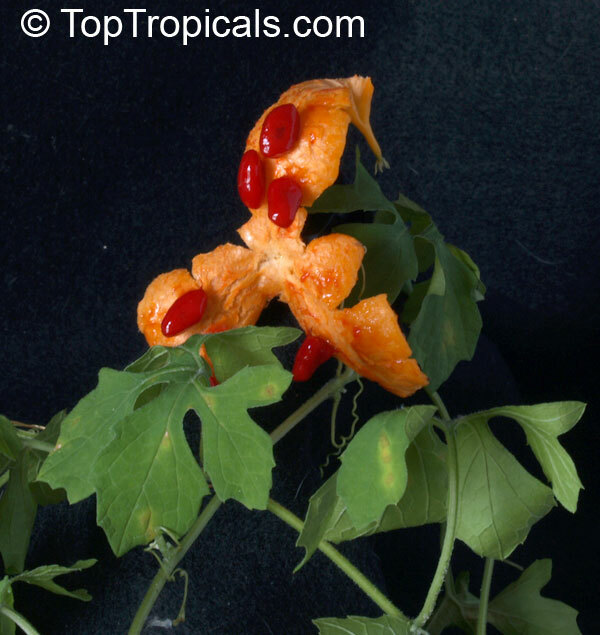 The orange pulp contains bright red arils which enclose the seeds. 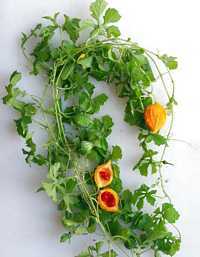 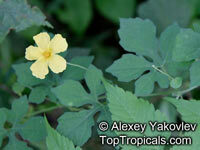 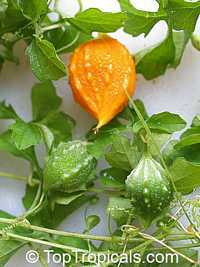 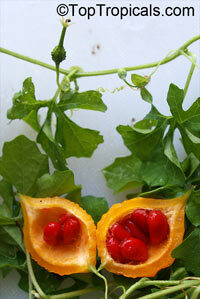 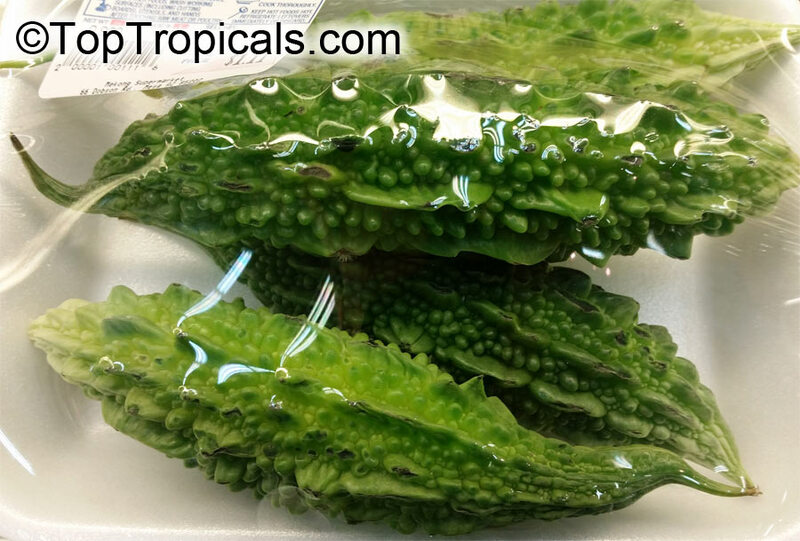 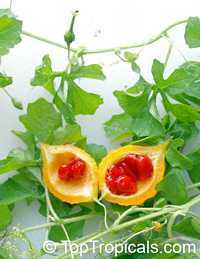 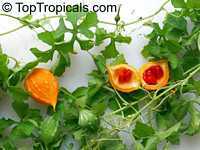 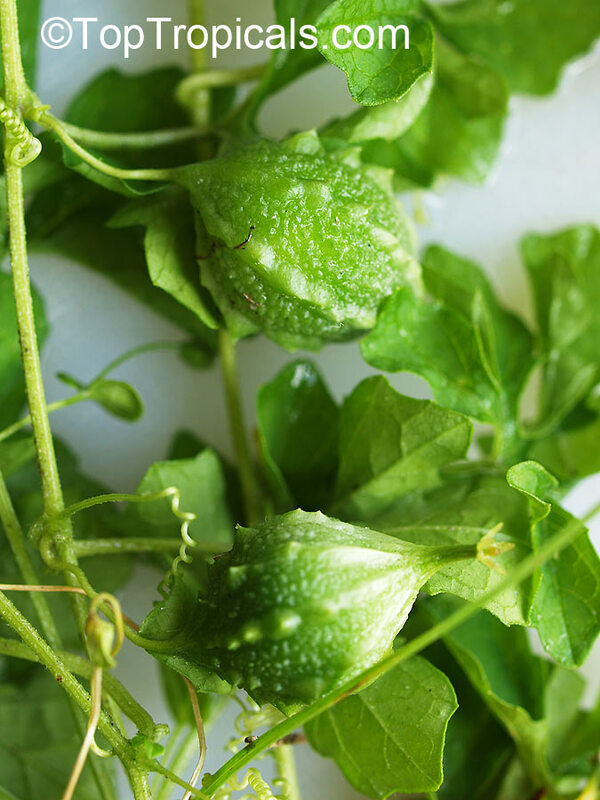 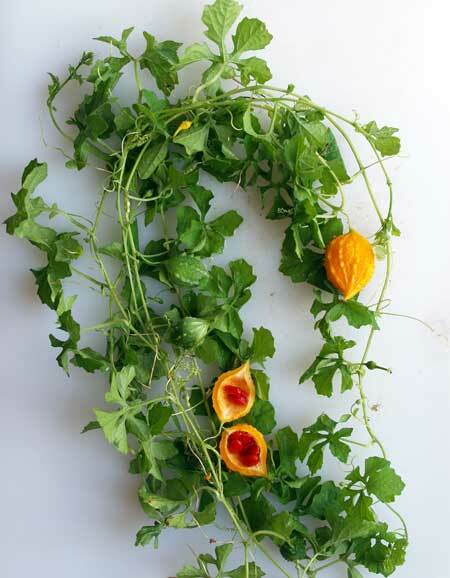 Momordica charantia has been used extensively in folk medicine as a remedy for diabetes. 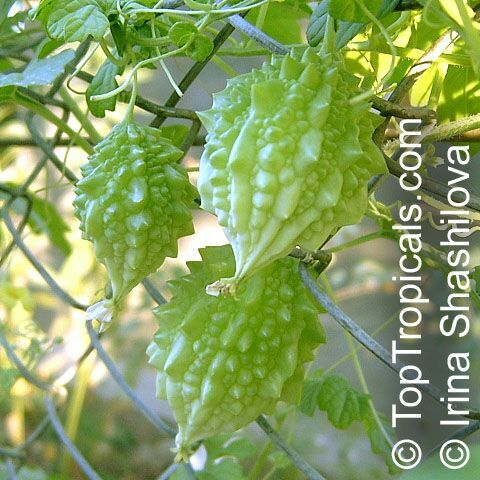 In Ayurveda, the fruit is considered as tonic, stomachic, stimulant, emetic, antibilous,laxative and alterative. 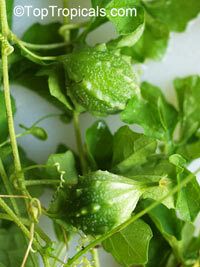 The fruit is useful in gout, rheumatism and subacute cases of the spleen and liver diseases. 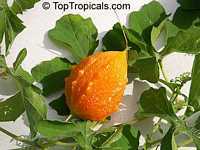 It has also been shown to have hypoglycaemic properties (anti-diabetic) in animal as well as human studies. 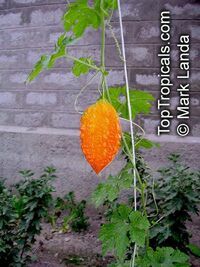 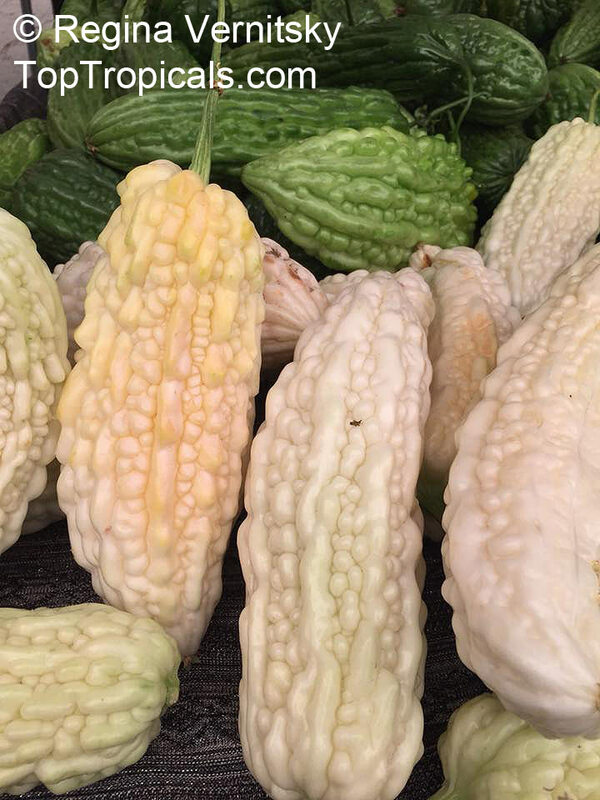 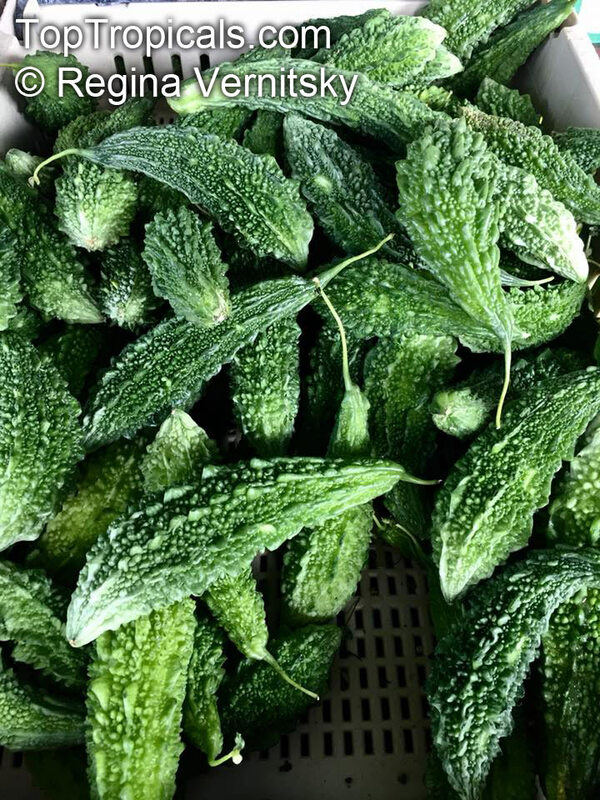 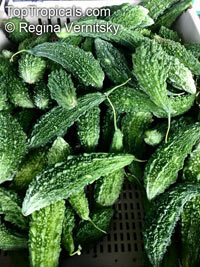 Plant in rich moist soil, in frost free areas, since bitter melon is very sensitve to frost. 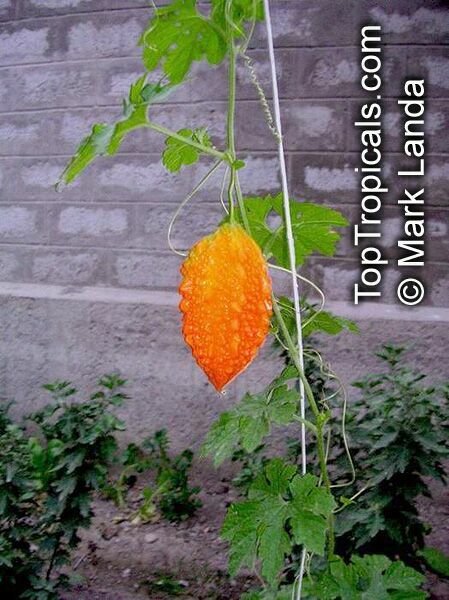 Do not water too much. 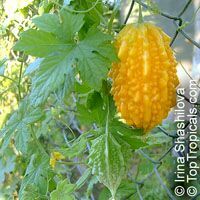 In cooler climates start planting in pots 6 weeks before the frost free date; transplant when there is no more danger of frost. Bitter melon is generally consumed cooked in the green or early yellowing stage.